The following text originally appeared in Music & Literature no. 7 as part of an extensive portfolio celebrating the Welsh author and music critic Paul Griffiths. Written in honor of György Kurtág’s ninetieth birthday, it is reproduced here on the occasion of the 15 November 2018 world premiere of Kurtág’s operatic adaptation of Samuel Beckett’s Fin de partie (Endgame) at the Teatro alla Scala in Milan, Italy. Celebrations in Budapest, on and around the ninetieth birthday of György Kurtág (February 19, 2016), rang with joy and pride. Though not the spry figure of former times, Kurtág is as alert and fiercely creative as ever; his long-awaited operatic setting of Beckett’s Fin de partie is now confidently expected for 2018, and he has meanwhile been producing other pieces, including last year a seven-minute score for large orchestra, Petite musique solennelle (2015), to salute another nonagenarian, Pierre Boulez. That piece was offered as the finale of the big concert on the birthday itself, in the recently refurbished concert hall of the Liszt Academy, which—besides being, in terms of acoustics as well as décor, one of the most beautiful music rooms in the world—would have been where Kurtág as a student first heard much of the repertory he knows so fully, and honors so fully in his work. The Petite musique solennelle—not so petite, though certainly solennelle—provides an example, beginning as it does with massive assertions of middle C, the note seeming to remember in its force and even in its scoring the symphonies of Beethoven while being held now in stalemate, before continuity turns out, after all, to be possible, the music going on slowly through marches of smoky harmony, pronouncements from trumpet and horn, and a glistening passage for a Kurtágian ensemble of twanglers: harp, upright piano, celesta, cimbalom, and tubular bells, all blending with an accordion. After this, the conductor—András Keller, whose history with Kurtág goes back more than thirty years, to when he was the violinist in the original performances of the composer’s Kafka Fragments, and who brought to this program exemplary care, understanding, and sensitivity—stepped aside. The evening, however, was not yet over. There followed a video recording of the composer and his wife, Márta, the two of them always inseparable, playing a favorite item from their repertory of transcriptions: the sonatina that opens Bach’s funeral cantata Gottes Zeit ist die allerbeste Zeit. Nor was that the end, for then the whole house stood for several minutes, as it had stood before a note was played, to applaud the creator of so much music, there nodding in appreciation, a little embarrassed, surely, but also surely a little happy and a little satisfied, in that moment before his task drew him on. A taste of that task had been presented the evening before, at the Budapest Music Center, which was responsible for the whole series of concerts, and which has given the Kurtágs a home in the city. Fin de partie, it was revealed, is to begin, before getting to the play text, with a setting of an English poem by Beckett, “Roundelay,” performed by the singer who will then take on the role of Nell. Kurtág’s alliance with Beckett, his long-destined companion for clarity of vision and precision of utterance, started only when he was in his sixties, and then as if by accident. Ildikó Monyók, an actress and singer, had lost her power of speech as a result of a car accident, and was relearning to enunciate words by singing them, one at a time. Kurtág was reminded of a late Beckett text, “What is the Word,” which he then set in Hungarian translation, in 1990, for Monyók to perform to prompts from an upright piano, as if enacting on stage one of her therapy sessions. With an intimacy for which there is no parallel, the work was thus tied to her voice, her person, her case, and, since her death in 2012, anyone performing the piece will have had to be performing her performing it—though this is perhaps less true of the enlarged score Kurtág went on to compose, in which the soloist and her accompanist-therapist-interrogator, on the concert platform with a few instrumentalists and the conductor, are confronted, shadowed, challenged, mocked, and harangued by groups of instruments and voices placed within the auditorium. Kurtág had used this kind of dispersed orchestra shortly before, in …quasi una fantasia…, the remnant of a piano concerto, and was to do so again in his double concerto for cello and piano, in Messages, and in New Messages—all works included in the birthday concert at the Academy, whose layout of balconies may represent what the composer has in mind for these exploded scores. In his original setting of “What is the Word,” Kurtág elides the difference between singing and reading aloud. The vocal line is made not so much of melody as of traverses from one note to another, one syllable to another, rising or falling as a reading voice would rise or fall, to color or emphasize. Where the line flows a little, it often does so in chromatic scales, always descending—again like the voice of a reader, now petering out. The composer was obviously led to such a way of writing by Monyók’s condition, but the style was to outlast this particular opus and go on into the Beckett sequence that came soon after, …pas à pas—nulle part… (1993-8), which sets a string of short poems in French leading up to a group of aphorisms by Sébastien Chamfort, the original texts intermingled with English translations by Beckett. A much longer work than either version of the “What is the Word” setting, …pas à pas… was written for a professional singer, the baritone Kurt Widmer, and demands a range of over two and a half octaves. Also, the humble upright of the earlier composition is replaced by a trio of string virtuosos and an athletic percussionist. In terms of vocal style, though, the two works are akin. There is the same struggle to get the words out, a struggle that Kurtág’s setting transmits not only in its frequent pauses but also in its abundant shifts of speed or register. With no clinical cause to account for any difficulty in uttering, the cause must be found in the act of uttering itself, in the inadequacy of these words, few as they are in most of the poems, and in the inarticulacy responsible for their fewness. 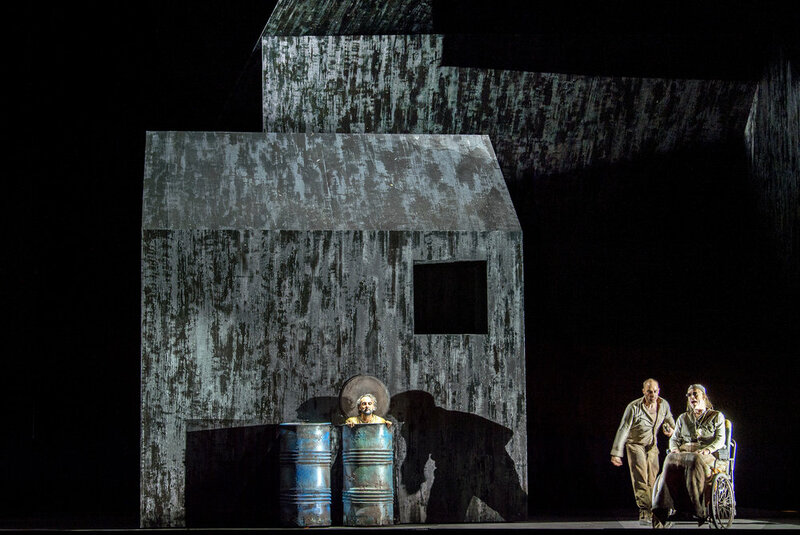 This tilts the frustration and the hampering in …pas à pas… away from the singer to the singing persona, the character summoned by what Kurtág has recreated as a Beckett monologue. We have moved from the sphere of reading to that of the theater—or, rather, we have discovered that to read is to act. For Kurtág to have gone from here to a Beckett opera now seems inevitable. 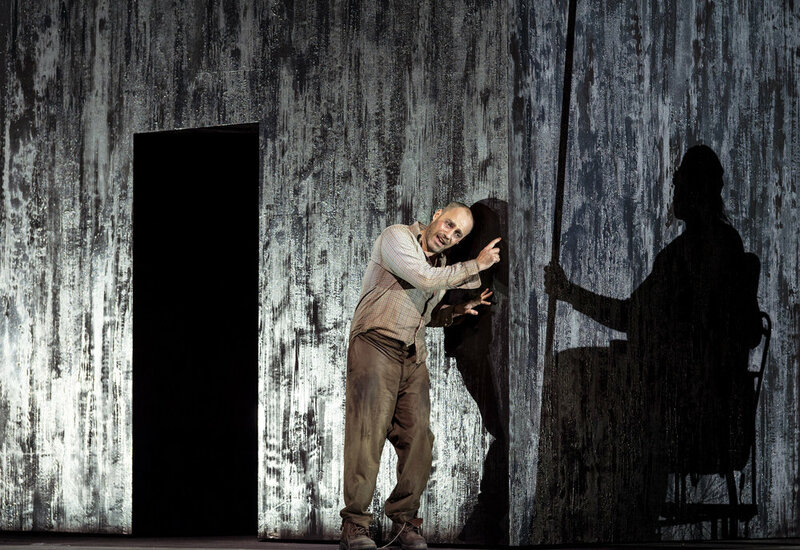 Contemporary with …pas à pas… was a Hölderlin cycle in which the singer—again Widmer, now performing largely without accompaniment—seems to be dreaming up the words, or nightmaring them up: a nocturnal companion piece to the Beckett settings. After that, Kurtág virtually abandoned solo vocal music, hitherto a common genre in his output, for almost a decade before returning with Colindă-Baladă (2007), a homage to Bartók and to the Romania of his own youth, with a tenor soloist intermittently joining double choir and instrumental ensemble, and Four Akhmatova Songs for soprano and ensemble (2008), both of these works taking place in a far more lyrical, more thoroughly musicalized universe. The new “Roundelay” setting suggests that Fin de partie, on which Kurtág began work in 2010, will again, not surprisingly, be more abrupt, more disrupted, to be delivered by voices less sure of where the next note, the next word, will be coming from, but that it will also be lit by the later lyricism. Shortly before this fragment was unveiled, we were given an important clue to its style when, in one of several clips from “home movies” shot by the composer’s video maker-granddaughter Judit Kurtág, the composer was discovered reading Fin de partie. To the extent that, in his settings of Beckett, he makes singing into reading out, he achieved a complementary transformation of reading into singing in his declamation. Characteristically scrupulous in its rhythm and form, Beckett’s “Roundelay” is indeed what it says it is: a poem with a two-line refrain that opens and closes: “on all that strand / at end of day”—two dimeters, tied by what one might describe as an end-rhyme that comes too soon. Kurtág’s setting makes the first line rise in pitch through the intervals of a Lydian scale, the second fall through a Phrygian. Left to right: Leonardo Cortellazzi, Leigh Melrose, and Frode Olsen in Fin de partie, 18 November 2018. Photograph: Ruth Walz. That certainly does not mean Kurtág wants his notation ignored, but it does mean he wants it regarded not as an ideal, a goal, but as a stimulus, to be surpassed. One problem with “making what’s written” is that the music may still indeed sound as if it’s written, may still convey the aura of paper and ink, of whatever pitches, note values, and dynamics are inscribed in the score, may not fully have passed from the domain of the lettered to that of the aural. To have achieved that transformation is, for Kurtág, the essence of performance as it is of reading out. The material is to be embodied, and then expressed from the body, as one could see and hear in his recitation, and as one could see and hear in his urgent manner at the piano, trying to convey to Summers what he wanted. Folk music, preliterate, has been a model for Hungarian composers since Bartók, and musicians of Kurtág’s generation were obliged to study it in Stalinist Hungary for ideological reasons; those Lydian and Phrygian scales are obvious traces, resurfacing. But there is more to it. Kurtág wants his music, like his reading, to have left the page far behind, to have no evident source, to come with the spring and the intensity of direct action. Another problem is that “what’s written” is, of necessity, depersonalized. Kurtág may often, and does often, work with performers over long periods while composing his music, but even so, the notation will have to be abstract, because incapable of recording personality as revealed in fine nuances of intonation, color, rhythm, and dynamic level. All these and more, performers will have to discover, and the celebrated coaching sessions are not so much about the composer telling the performer what to do as about both of them, through trial and error, finding what is possible—finding, suddenly, the gesture that works. Kurtág had Summers repeat the Lydian rise (“on all that strand”) and the Phrygian fall (“at end of day”) several times, seemingly seeking an opening in the one and a not-quite-parallel closure in the other, diminishing indeed into the night. He also took her again and again through the line “until unbidden go,” until—stumbling for words himself, and not only because he was conducting the dialogue in English—he happened on a fitting metaphor for the repeated emphases he wanted on that last vowel: “Barking. Like a dog.” Sharing his relief, Summers first exaggerated the canine effect, but then immediately settled into something that both she and the composer could feel to be, at least for the moment, conclusive. (A video-clip from the session was posted on February 22, 2016, by le mag on its website.) Throughout the fifteen minutes or so of their encounter, Summers courageously challenged the composer as much as he challenged her, required him to be specific about what he wanted, and so made the session far more valuable, for herself and for the audience, than it might otherwise have been. And all this over a four-minute segment. One can only imagine the work that will lie ahead when all four singers—plus the members of a largish symphony orchestra (a tantalizing glimpse of the full score, from which Abert had been playing, could be seen in the le mag feature)—go into rehearsal. Perhaps the whole opera will be found to follow the outlines of the composer’s reading, a reading that hovers on the edge of something more, becoming action. Paul Griffiths is a novelist, librettist, and renowned music critic. The author of more than twenty books on modern classical music, Griffiths was for many years the chief music critic for The Times and has written regularly for The New Yorker and The New York Times. His novel let me tell you was the basis for an award-winning song cycle by the same name composed by Hans Abrahamsen for soprano Barbara Hannigan and the Berlin Philharmonic. Banner image from the world premiere production of Fin de partie. Courtesy La Scala and photographer Ruth Walz.